We are looking for interesting Pay Per Click and/or Conversion Rate Optimization case histories for the new edition of ADworld Experience (that 99% will be on April 12-13, 2018, in Bologna – Italy). Your case study does not need to be a huge success. It only has to be useful to help people understanding how online advertising or CRO actually work and how to get the most out of them (as well as to avoid dangerous errors). You do not need to be famous. There are enough Web Marketing small talks online! 😉 We need numbers and facts, presented by professionals able to explain them in details, not opinions. You have not to manage big budgets. We are interested in repeatable strategies in one or more business areas. We will evaluate cases related to any online mass advertising circuit (AdWords, Facebook/Instagram, Linkedin, Bing, Twitter, Amazon, RTB and remarketing platforms) and whatever interesting CRO case history. There is not a real deadline to submit your ideas, but I suggest you to present your cases within November 30th, because in past editions by the end of the year the program was already 99% set. 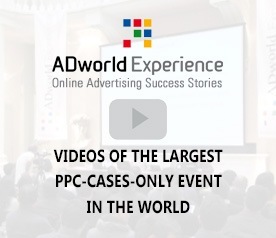 This is your big opportunity to join one of the largest events about PPC and CRO in the world (last editions of ADworld Experience gathered more than 900 participants). Don’t miss it. Drop us a line today at info@adworldexperience.it and send us a brief description of your case along with relevant details to evaluate it and a link to your site and/or Linkedin profile. Of course, all data you share with us will remain strictly confidential, unless you agree to speak about them at next ADworld Experience, of course ;-).